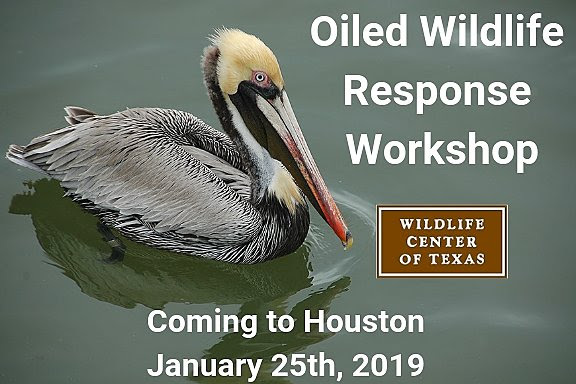 The purpose of the workshop is to certify and train personnel that are interested in assisting The Wildlife Center of Texas Oiled Wildlife Response Team during a spill. Certification and training are required for anyone who may participate in any role during an oiled wildlife response. The workshop will cover topics such as the effects of oil on wildlife, initial intake and exam of oiled wildlife, an introduction to OSHA training, wildlife rehabilitation’s role in Incident Command System, and actual hands on cleaning of oiled feathers in which participants will practice by washing an un-oiled white duck. We would like for all permitted wildlife rehabilitators and trainees, U.S. Fish and Wildlife Service, state wildlife officials, industry environmental personnel, local veterinarians, veterinarian technicians, as well as interested citizens to participate in this training. RSVP via e-mail with your information to [email protected]wildlifecenteroftexas.org. There is no cost for the workshop, but spaces fill up quickly and seating is limited, so please register as soon as possible.